It is standard to use a longer turning radius on a freeride ski than on a slalom ski in the skiing industry; however, Furberg Snowboards is the only brand to adapt the turning radius for splitboards. A longer turning radius generates better stability at higher speeds and, more importantly, gives the boards a calmer and more forgiving behavior by distributing the edge pressure over the entire contact length. When a board is ridden flat on the snow, a long rocker transition will make the nose of the board impact irregularities with a low angle of incidence and slide over with little resistance. 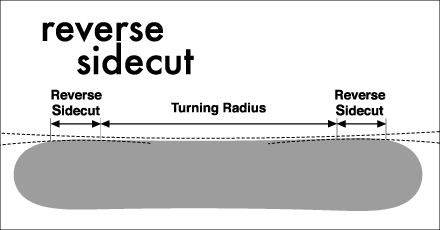 Many snowboard brands are aware of this, but only we have combined the rocker with a reverse sidecut in nose and tail to maintain this low angle of incidence when riding the board on edge. The long transitions of the reverse sidecut make the board turn more effortlessly since the typical pressure points at the end of the effective edge do not exist. The overall result is a very catch-free and surfy board. Furberg Snowboards keeps pushing the freeride snowboard revolution. Get on one of our boards and we are convinced that it will be the most versatile and game changing freeride board you’ve ever ridden! We are using 100% Poplar for the perfect balance between weight, strength and ability to hold flex and shape over time. The base is 1.3 mm thick, which is thicker than industry standard. This means that you can hit rocks harder without getting core shots and you can stone grind the base more times. Isosport 7500 Sintered is one of the fastest bases available on the market. The thicker base does add a few grams on the weight, but more importantly it gives the board a much longer life. Triaxial fiberglass is used in all our boards to get a good torsional stiffness, which gives better edgehold.